There are just too many red sauces out there. I equate the abundance of red sauce in the world to the amount of green in nature. The most intriguing plants in nature are the ones with exotic colors like bright blue, orange or purple. In similar fashion, chile verde sticks out with it’s light green, almost vomit-colored sauce. But don’t let that dissuade you. This gem of a sauce is made from tomatillos (mild green tomatoes) and jalapenos, and is full of wonderful flavors. If you don’t lick the pot clean when you make the chile verde, this is a great way to use the leftovers. As I always say: sauce is the sauce of life, and this is one sauce worth living for. 1. Preheat oven to 400. Line a baking sheet with tinfoil. Spray a quick shot of cooking spray on one side of the tortillas and place them, spray side down, on the baking sheet. Bake for 4 minutes in the oven, then flip them over, sprinkle the cheese down the middle of each one and place back in the oven for 3-4 minutes. 2. 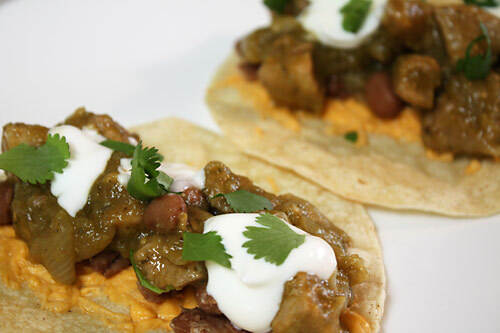 While the taco shells are baking, heat the chile verde in a pot on the stove or in the microwave. When the tacos are done, pile on the beans, chile verde, sour cream and cilantro. I’m with you on this one. The color green is just infinitely more appealing than the color red. LOL my colleague and friend makes this at home all of the time for many dishes…I enjoy it more than red sauce! Thanks for sharing! do you really always say that? do your friends roll their eyes or chuckle when you do? i chuckled–it has a nice ring to it. also, these tacos rock. Haha, I do always say it. I enjoy using words and expressions in different circumstances or in this case, their literal translations. I am with you on the over abundance of red sauces, especially since I’m not a tomato lover. And yet, I’ve still never tried out a salsa verde. Crazy, no? Yes, you’re loco. Just as long as you don’t consider little green tomatillos tomatoes, you’ll love it! Give it a try!